Works great this compact bazic compass. compass orienteering lines - scale map for mapping navigator - accurate magnifying glass maps. Lightweight Green boyscout compasses easy to use for beginner cubscout and eagle scout. This accurate outdoor compass is basic navigational tool in your Backpack or pocket gear. Manual magnet compass with 360 degree rotating bezel, magnifier for geological maps with metric base and nylon lanyard. Hand held scouts compass perfect tools for outdoor travels, hiker mountain bike, cycling and walking holiday. 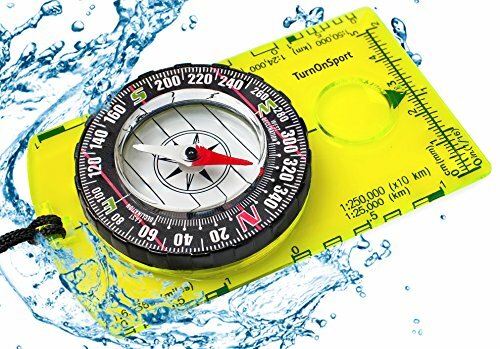 This economy compass with utm map tool best accessories for world map, it can be used by adults and kid's. thanks to the liquid-filledcapsule (bubble free). Acrylic Baseplate Compass with Azimuth Bearing and 360 degree rotating bezel. For cartographic map navigation and reading with Field Compass located Magnifying Glass, compass Ruler and 1:24000 compass Scale. Durable and Lightweight Compass for Hiking Backpacking. Best Cub Scout compass for Kids. BSA Compass Best Gifts for Beginners Boy Scout Boys and Girl. Professional Advanced Compass for Camping - Orienteering - Hiking - Hunting - Survival - Navigating - Mountaineering - Outdoors - Field Trip. Portable Handheld Compass with magnetic needle and directional arrow, orienting lines compass and lanyard. Real Compass Oil - magnetized needle made by vacuum technology completely filled with a liquid oil. Vertical Simple Compass great come up navigational, orientating and backpackers for men and kid. If you have any questions about this product by TurnOnSport, contact us by completing and submitting the form below. If you are looking for a specif part number, please include it with your message.